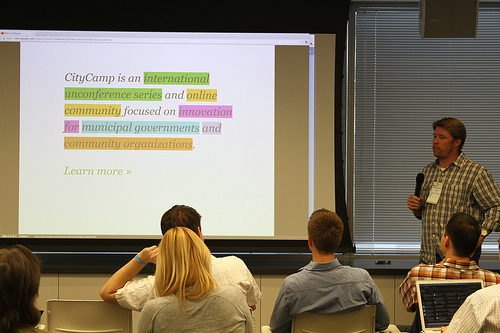 How can the third Transparency Camp be so local and so international at the same time? So far, I have always tried to join via live stream, or through the tweets, but nothing like being there. With me being in Washington now, I was quite excited about joining for real! It was great to see that the Transparency Camp went international! Not only because I was really happy to meet some of my old Transparency International colleagues from Slovakia, Georgia, Lithuania and Argentina and learn about their latest projects! But also to get to know about new initiatives that look into transparency and ways of including citizens in what’s happening in their countries. Pedro of Ciudadano Inteligente presented his suite of really nice projects in Chile: Acceso Inteligente provides an easy way to make access to information requests to multiple government institutions through one platform; and Vota Inteligente, a project that follows up on a platform developed to inform voters during the Chilean elections and transformed into monitoring the congress. Another useful project of visualising corruption cases in India can be found here. I felt these international perspectives weaved in quite well with the domestic experiences. But the trend during this year’s camp was a clearly a greater focus on local issues. Looking at how to create greater integrity and transparency on a local level has been an issue I’ve been interested for a while. It was too bad that only one person from a municipal government was present. But he was warmly welcomed! Here’s my take on why that local has become a trend. What do you think? 1) I felt that there is a disillusion with regards to transparency efforts on a federal level, especially with the cuts in the budgets for data transparency and government accountability programs. The city and state level provide new playing ground. 2) The local level is of course where problems become most evident. You see the road in front of your building every day. By the way, why is it that roads are the pars pro toto for localness? A great example for a city that has really embraced a digital strategy engaging with its citizens is New York – from a @311NYC Twitter account to all sets of public data! Another one, especially relevant for anti-corruption initiatives, is the Philly Watchdog anti-corruption iPhone initiative in Philadelphia that allows to report fraud of public officials. Here’s a great summary by Alex Howard of how local governments have been using technology in government. 3) The fact that problems are most evident, makes them easily actionable. Here’s something actually everyone can engage in somehow. This seems to be the reason why City Camps became quite successful. At the Transparency Camp I first heard about them, but I love the concept and it’s what I have thought about when talking about hyper-local integrity systems. Through such a system which would be supported heavily by data, technology and social media solutions and platforms, all actors in a community will be able to engage collaboratively in and for their local community. Ideally, these systems will include key projects providing transparency of community-relevant information by the local administration and services, facilitating public monitoring of services and complaint mechanisms, as well as citizen fora and reporting to discuss issues relevant to the community. Basically it means, let’s get the people together to talk, discuss and find solutions together. Looking at the case of Alexandria, VA, it became obvious that working together is crucial. In an interesting session on local government transparency, Craig Fifer of the City of Alexandria, VA provided some insights on difficulties of local government collaboration with SeeClickFix, and highlighted the need for self-owned monitoring systems, as they would provide a better integration with already existing municipal classifications and categories. But of course, often, civic engagement is needed first to make sure municipal governments actually start acting on it. So, as Craig said, the potholes are there anyways. Better have them reported! Finally, a big thanks to Sunlight Foundation and the amazing team. A great weekend! At the last International Anti-Corruption Conference we had a great session (in my view anyways) looking at how to get data, what to do with it and how to make it accessible and transparent. And finally, how to make it useful to engage citizens and government. How we use theoretical information and collected data is key. To target interventions to support citizens and to make strong arguments in a competitive media environment, we need to use our data to help create meaning – to help tell stories. We can use interactive info graphics, mapping tools and other technologies to reach new audiences and strengthen advocacy strategies. We believe that presenting information and visualising data can be an incredible tool to understanding corruption and its impact on people’s lives. In our session we would like to find out how we can improve engaging with citizens and [game-changers] using existing and new technologies. This was part of the People’s Empowerment session that tried to showcase and connect a wide range of initiatives that have demonstrated their impact in empowering people. How much is one trillion dollars? It’s US$ 166 per person. A road around the equator. Fund the military of NATO countries. 2) The session will show you the power of data and information. 3) It willl show you how to get data hiden on local government websites, and make it accessible and attractive for making change. 4) It will make the step from technology and information > to citizen participation! >>> Information is power. We’ll show you how to use it. In terms of outputs, these are the tweets that I did during the meeting, enriched by some additional links. I hope they are useful for some of you. Within the framework of the conference, the workshop was a great success in my view. A lot of people, and a lot of questions on how to get the data, how to use it, and how to make information activism work for organisations that have traditionally published long reports (have a look at TacticalTech’s guides). The success was because Stephanie and Marek from Tactical Tech, Hernán from Poder Ciudadano and Gonzalo Iglesias of Garagelab, as well as David Casaes of Esfera Publica representing the Technology for Transparency Network that did such a great job in presenting and discussing the issues and responding to the questions. Big thanks. By the way, check out the new Technology for Transparency Network pages. The new categories introduced give a much better access to the projects. What other examples for powerful and actionable visualisations do you have? a new interactive website and global network of researchers to map online technology projects that aim to promote transparency, political accountability, and civic engagement in Latin America, Sub-Saharan Africa, Southeast Asia, South Asia, China, and Central & Eastern Europe. For me, the network launched yesterday will be a great opportunity to connect the many examples and innovative solutions that have emerged over the last couple of years, and bring us a step closer to find effective and sustainable means to empower and give voice to the people themselves. I am very grateful to have been invited to advise on this network in such a selected group of colleagues and am sure that all of you following this blog will find valuable information, great ideas and discussion over the coming months. 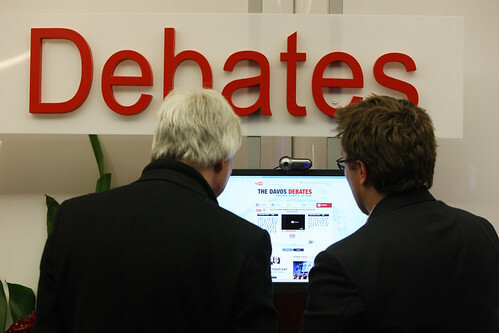 Why bother about this year’s Davos and the Annual Meeting of the World Economic Forum? Especially, as one of the impressions I got from this year’s meeting was the feeling of helplessness in the discussions on how to tackle the economic crisis. I think that this challenge the world is facing needs to come with the recognition for two dominating aspects of the solution, and that might scare some to take the next step: one being the need for letting go of conventional approaches; and the other being the request for a new openness and transparency. At least, questions of ethics and accountability have been included in the agenda this year. But, the promise of this new era of responsibility has to be monitored by everyone. Where, in the era of social media, are the masses on the streets, holding the people responsible accountable? Nearly 80,000 viewers have watched the video of the Forum’s youtube-contest by Colombian Pablo Camacho, 24, discussing the need for a n International Code of Ethics for CEO’s. His suggestions may not be taken up right away, but can serve as a perfect motto for 2009: “Make money, but do not harm others”. And also have a look at the impact of social media at Davos, and especially of Twitter, via this nice sum-up by James Conell on the New York Times. Here you can find the official page of all social media channels by the WEF. 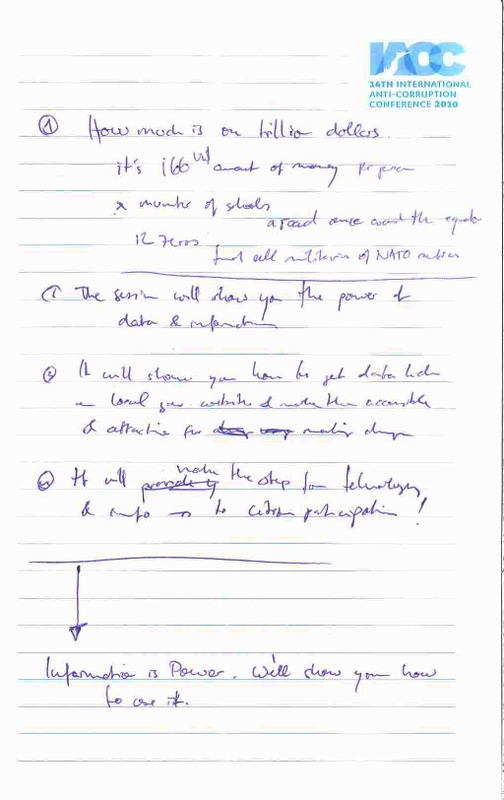 And here Transparency International’s requests to the world’s leaders. 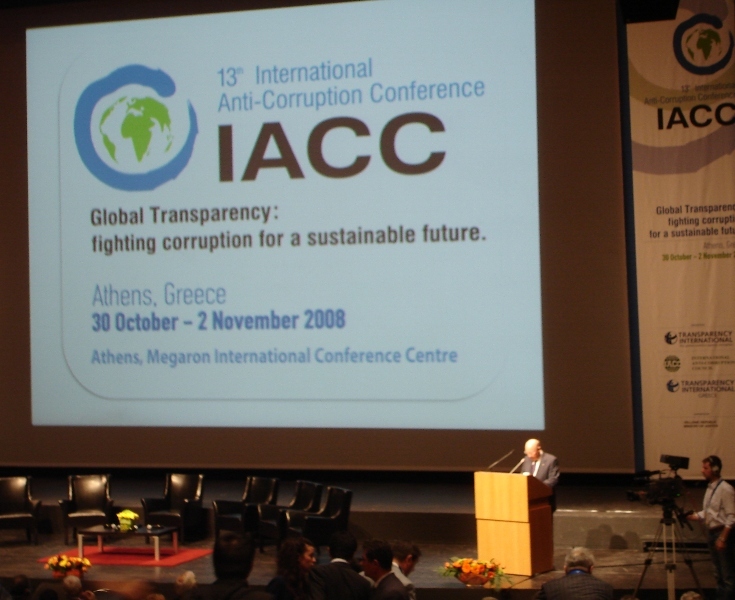 The 13th IACC conference started with a panel on corruption, peace and security. Let me reflect on a couple of issues mentioned during the session. One of the panellists that got me thinking was Irene Khan, Secretary General of Amnesty International. She highlighted that a Transparency International list of countries with high levels of corruption would look very similar to an Amnesty International list of countries with high levels of human rights violations. Human Rights can be important tools fighting corruption, especially the right for freedom of expression and freedom of assembly and are an underutilized legal framework to fight corruption. Already in this opening plenary it becomes clear that it there is an essential need for the right of citizens to be involved, the right of victims for a voice. Khan said, and here I see a link to this blog: “The best tool to fight corruption is an empowered citizen.” As I had argued earlier, social media is about empowering people. This “social transparency”, being accountable towards the citizens, demanding leaders, politicians, to account to what they do, can be supported by the use of social media. Another issue raised was on stolen money that, as Mark Pieth, Chairman of the OECD working Group on Bribery in International Business Transactions stated, must be hidden somewhere. More transparency, especially within global financial flows is urgently needed, as also Transparency International pointed out in its resolution of this year’s Annual Membership Meeting ahead of the 13th IACC. It would be great to use crowdsourcing concepts to identify flows and assets of CEOs or politicians. To match the money with the people. As Pieth said, if dictators find it more difficult to hide their bounty in financial centre, this contributes to corruption. Maybe if they find their mansions and Maibachs posted on the web, people will become aware. A map on google un-hiding the villas by political leaders. A question to the panelist asked them, what each one of them could do to fight corruption. So here are just some initial thoughts, if you have any ideas, I’d be interested in hearing and reading them here! What can you do to fight corruption? I’m delighted to participate in this group blog and even more pleased to have an opportunity to talk about Accountability 2.0 with such a distinguished group of colleagues at the conference this week. I thought that before making the journey to Athens that I would give the readers of this blog a short overview of Sunlight’s work here in the U.S.
Sunlight was founded in January 2006 with the nonpartisan goal of using the Internet — the new information technologies and social networks — to enable citizens to learn more about the work of our government and to create a more positive and interactive relationship with their elected officials. Initially we focused exclusively on the U.S. Congress, but we already extending our work to focus on the U.S. government at large. From the beginning, our work has focused on shedding “sunlight” as a way to help reduce corruption, to ensure greater accountability by government and to foster a public trust in the vital institutions of our democracy. Sunlight is unique in the U.S. in that technology and the power of the Internet is at the core of all of our efforts. All of our work — websites, databases, visualizations, lobbying — is based on the premise that the collective power of citizens to demand greater accountability is the clearest route to a real democracy and that transparency can make a huge difference in building public trust in the institutions of governance. Transparency can stop bad things from happening, for starters. It can allow citizens to become their own watchdogs, and it can give NGOs the fuel they need to create more effective advocacy campaigns. Sunlight’s work serves as a catalyst to enable citizens to better understand, monitor and hold elected officials accountable; help investigative reporters, bloggers and citizen journalists do the research necessary to better inform the public; help citizens interested in following and hsaping politics to more easily inform themselves (and their readers and social networks) and get engaged; and push and pull our government into a much more expansive relationships with the public. We’ve launched numerous innovative websites, databases, and tools to that end. I’m very much looking forward to sharing more details with our fellow panelists on Saturday afternoon an to learn more about how others are using the social web in their work. The move by Broadridge comes after the SEC adopted changes to its rules in February designed to encourage the use of electronic shareholder forums by public companies and their shareholders. The SEC sees online forums as a way to improve communication between shareholders and companies and cut the number of shareholder proposals submitted for inclusion in annual meeting proxy statements. The SEC’s encouragement of companies using new technologies to facilitate communications is finally starting to take off, and we think that in the not too distant future shareholder forums will become standard on many company IR websites (at least for those companies not afraid to embrace new technologies, and not afraid to have a dialogue with shareholders). UPDATE 23/09: ..As I continued browsing to look for more information on investor relations 2.0 I found another great post that puts all this nicely into a broader context. This illustrates a number of issues we’ve discussed upon developing the workshop programme and sparks a few further thoughts (and I would expect us to debate those fervently).